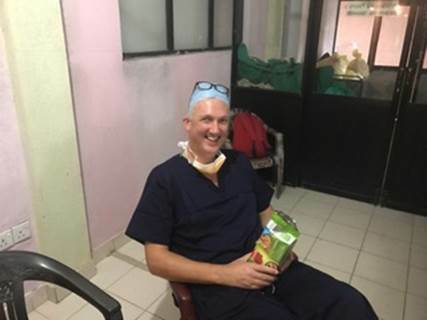 Gills chairman Paul Scally and the Take Heart Mercy Mission medic team are now in Sri Lanka for this year's all-important trip. 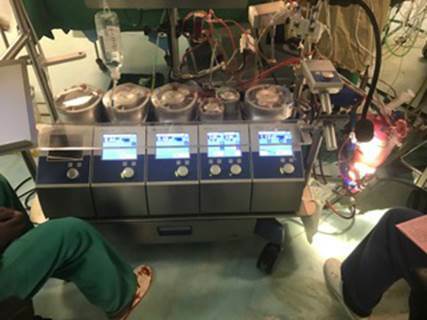 Between now and Friday, October 21, the charity's surgeons will perform up to three life-saving heart operations on children each day. Furthermore, staff from Gillingham Football Club's Community Trust will be coaching up to 1,200 poverty-stricken children football skills. On the final day of the Take Heart Mercy Mission 2016, the GFC team and the medics took on St Aloysius in a football match at the school. Team GFC were kitted out in the blue and white of Gillingham Football Club, with St Aloysius wearing yellow and green. Gills chairman Paul Scally and the GFC Community trust staff are greeted by the school children of St Aloysius, whilst they enjoy their morning break. 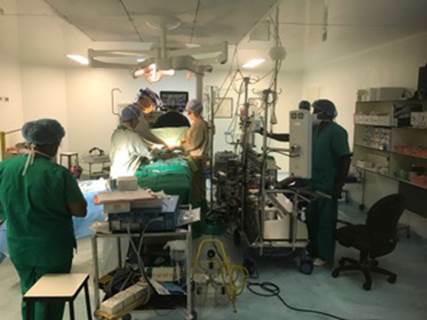 Conal Austin and his team at work in the operating theatre. Gillingham chairman Paul Scally visits St Aloysius College in Galle, Sri Lanka, and speaks to the Headmaster, Mr Ranjith, in the 100-year-old school library. The GFC Community Trust coaches are introduced to the enthusiastic school children by Headmaster Mr Ranjith. A patient awaits surgery with Take Heart, stood in front of the Take Heart Mercy Mission 2016 banner. 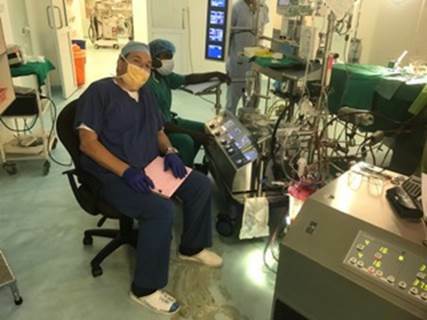 Perfusionist Jeff Steers manages the heart bypass machine. 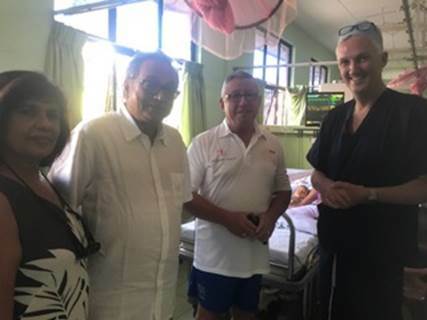 Paul Scally and Conal Austin show Take Heart sponsors Sri Lankan Airlines’ chairman Mr Ajith Dias, and his wife, some of the patients who have had heart surgery. Whilst the children are playing football at the sports complex in Galle, there are patients being treated in the Intensive Care Unit. 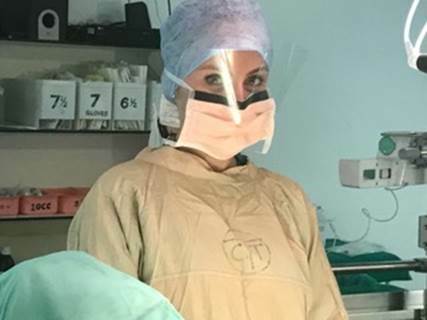 This 13-year-old girl has just come out of the operating theatre, and is being taken care of by Take Heart sister Jane Stenhouse and local staff. Here, Ewa and Libbie, our scrub nurses from the operating theatre, take a break between operations. Gills chairman Paul Scally takes a look around the Intensive Care Unit and meets some of the staff, both from the UK and local. 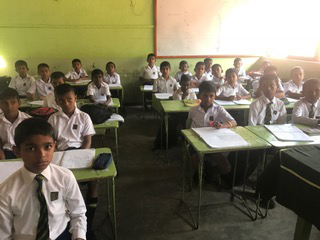 Club chairman Paul Scally has been a busy man during his time in Sri Lanka - here are his latest pictures from this year's Take Heart Mercy Mission! 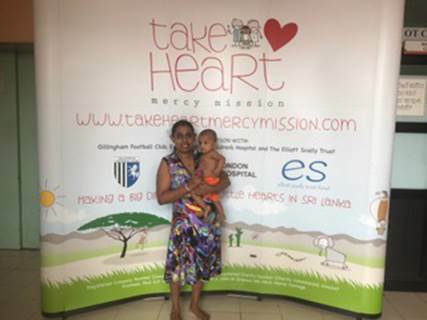 Having left London Heathrow on Wednesday night, the Take Heart Mercy Mission travelling party arrived in Sri Lanka on Thursday morning British time. Gills chairman Paul Scally writes: "Sixteen staff and two trucks of supplies and equipment have reached their destination after a long journey. We were welcomed by staff at the Lighthouse Hotel in Galle, and were asked to each light a ceremonial candle." Gills chairman Paul Scally writes: "The 2016 Take Heart Mercy Mission Team left Heathrow on Sri Lankan Airlines' stunning new Airbus A330, bound for Colombo in the capable hands of Commander Yasith de Silva, captain of the aircraft. 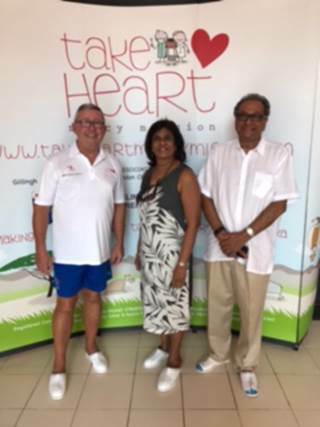 "Many thanks to Sri Lankan Airlines for their sponsorship of Take Heart, and thanks to all the Gills fans and sponsors who have made this trip possible." Commenting on the 10-and-a-half-hour flight, the chairman added: "Great aircraft, fantastic staff and wonderful service."